Let inspiration strike with Cavallini. Cavallini is never short of inspiration, whether it’s an old Parisian city guide, or an 18th century engraving. They bring a tapestry of patterns and colours together to create something beautiful, functional and inspiring. 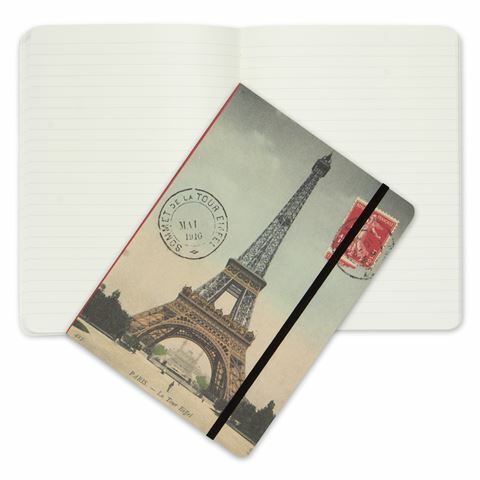 Featuring a retro-inspired illustration of Paris’ most famous monument, Cavallini’s Eiffel Tower Notebook is exemplary of the company’s design ethos. For jotters and daydreamers everywhere, Cavallini’s Eiffel Tower Notebook has you covered. With lined pages and an elastic closure, you can simply throw it in your bag for easy portability, and you’ll be able to document everything as it happens! How’s that for versatility?! 144 Lined pages makes writing a breeze – no need to worry about veering off the page! Vintage- inspired illustrations make this notebook a beautiful gift or a treat for yourself. Dimensions: 21 x 15 x1cm.